Inspired by her love for both fiction and food, and using her previous success channeling a popular culinary-ridden cult film with The Unofficial Hunger Games Cookbook , Baines threw herself into the historical research and recipe testing that Downton fans like herself deserved after falling for the "magical" dining and entertaining scenes at the core of the series — and the lessons about proper hosting proffered from such historical fiction. "I love and enjoy all of Downton Abbey, but to me, the first season (and sure, even some of the second) is magic," Baines says. "Any of the early dining/entertaining scenes between Matthew and Lady Mary, when they're verbally sparring with one another, or with the Dowager Countess mocking them, are just golden. And of course no one can forget the salt for sugar Raspberry Meringue hilarity with Mrs. Patmore and Daisy. It's almost as classic as dropping the chicken. Perhaps that was a nod to Julia Child?" In addition to wonderfully rich-tasting, if not expensive, cocktail party-ready recipes based on the show and its historical era in Britain, Baines also provides insight into the origins of food traditions like the Sunday Roast ("a way for housewives to kill two birds with one stone...cooking this fancy roast on the 'day of rest' and then serving the leftovers on Monday while doing the weekly wash") and advice for becoming a proper host. "There's a tendency for hosts — especially in their early twenties — to have a laissez-faire style of entertaining," Baines says. "At those parties, there's a beer keg in the corner and you're surrounded by strangers and no one really feels hosted. As a host, you're responsible for making everyone feel comfortable and at home. This involves introducing your friends — perhaps strangers to one another — aiding conversation and "the flow" of a party, making sure everyone is well fed and no one is stuck alone in a corner. Hosting is not just a responsibility, it's an art form. And I think by watching Downton Abbey we can see some really great hosts in action." According to her book, proper Downton-era etiquette requires invitations be sent out at least 7 to 10 days prior to an event, though Baines (and we) think you can get away with such improprieties if you serve these high tea or cocktail-appropriate recipes — along with, perhaps, some Crawley Sisters Stuffed Mushrooms (page 22), Grand Gougeres (page 122), or Classic Cucumber Sandwiches (page 157), at your viewing party soiree this Sunday. Photo: Sylvia McArdle & Stephanie Hannus/F+W Media. Used with permission. As any experienced chef would know, bleu cheese brings out the sweetness of figs like no other ingredient. Thus, Mrs. Patmore would bake these delicious hors d'oeuvres that are simultaneously sweet and tart. Eaters beware, however: Nothing is as tart as the Crawley sense of humor! 1. Preheat oven to 350 degrees F. 2. Roll out puff pastry sheet on a clean, lightly floured surface. Place puff pastry sheet in a well-greased baking pan and then place another sheet pan on top of puff pastry to prevent it from rising too much. 3. Bake puff pastry in a preheated oven (with sheet pan still on top) for 5-8 minutes or until beginning to turn golden. Remove and set aside. 4. To make walnut crunch: In a medium-sized skillet, stir honey, sugar, butter, cinnamon, and salt over medium heat until butter melts. Cook mixture until it boils and reaches a deep golden brown, about 3-5 minutes. Stir in cream, followed by walnuts. Cook for an additional 2 minutes, then pour out over a sheet of heavy foil. Let cool completely, then chop walnut crunch into small pieces. 5. To prepare figs: Mix sugar, water, and salt in a heavy skillet over medium heat until sugar is evenly moist, adding more water if needed. Cook mixture until sugar turns golden, stirring occasionally, about 5 minutes. Place figs cut-side down in sugar mixture. Cook figs until they begin to release juice. Immediately add butter, swirling skillet to melt. Remove rom heat and add port. Let figs marinate in port mixture for 5-10 minutes before removing figs to a plate to cool. Once again bring syrup to a boil, whisking until smooth. Cool completely. 6. Using a 2- to 3-inch pastry cutter, cut out rounds of semi-baked puff pastry. Divide walnut mixture among rounds, then top with fig halves, cut-side up. 7. Bake tartlets in preheated oven (still at 350 degrees F) for 30 minutes or until golden brown. Removes from oven and let cool slightly. 8. 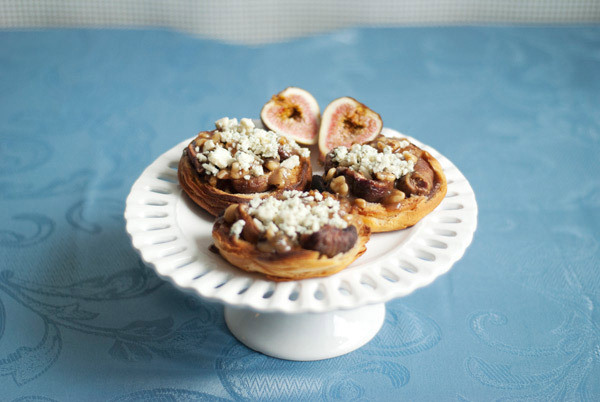 Artfully arrange cheese on top of tartlets, followed by the sweet port syrup. Drizzle with honey and serve. This dish would be a favorite of Countess Cora's to offer to her younger guests with their tea. 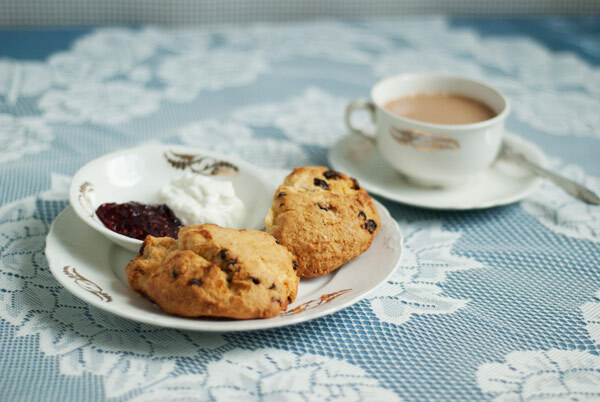 While visitors such as the Dowager Countess might prefer less flavorful options, these scones would give a needed variety — not to mention flavor — to a meal that most of Cora's guests would have experienced on a daily basis. 1. Preheat oven to 375 degrees F. Lightly oil a baking sheet. 2. In a large bowl and using a wooden spoon, mix together the flour, both sugars, baking soda, baking powder, and salt. 3. Using your bare hands, work the butter into the flour mixture until it has the consistency of bread crumbs. Add berries, mixing well, so that the berries are evenly distributed. 4. In a small bowl, mix together the buttermilk and vinalla extract with a fork. 5. Once again using your hands, dig a well in the center of the dry mixture and pour the buttermilk mixture into the well. Still using your hands, combine the ingredients until the entire mixture appears wet. Do not overknead. 6. Turn the mixture onto a lightly floured surface. Gently pat down the dough to make a disc about 1 1/2-2 inches thick. Using a biscuit cutter (or a knife if you don't have a biscuit cutter), cut out as many scones as possible and lay them on the baking sheet. Gather together the remaining dough to cut out more scones...but once again, don't knead the dough too much. 7. Liberarlly brush heavy ceam over the top of each scone, then sprinkle them with sugar. Bake the scones for 10-12 minutes or until they are lightly browned. Download the entire The Unofficial Downton Abbey Cookbook for Kindle ($10, Amazon.com) for a full lesson on both upstairs & downstairs cuisine in 150 recipes. Find Baines in all her butter & sugar glory at @LiteraryQueen on Instagram — her new cooking website forthcoming. Excerpted from The Unofficial Downton Abbey Cookbook written by Emily Ansara Baines, Copyright © 2012 by F+W Media, Inc. Used by permission of F+W Media, Inc. All rights reserved. Photos by Sylvia McArdle & Stephanie Hannus.